On January 8th, the Bren Communications Center hosted a 4 hour workshop on developing and delivering compelling presentations. This post is focused on part IV of the workshop. 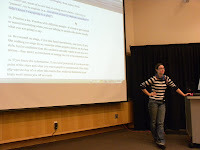 Bridget Dobrowski (MESM '09) contributed to our Bren blog last year (see "Suggestions for Developing a Memorable Presentation") and emphasized the following points related to delivery during our workshop. Bring water. You'll want it, plus sipping it is a good way to slow down or take a moment to relax. Decide WHAT you want to say but not HOW you want to say it. Don't say the same words every time you rehearse. It's very hard to have something 100% memorized and have it not sound rehearsed. Your audience is also going to take the gist of what you say and translate it into their own words/understanding anyways. So don't worry about exact wording. Own your own presentation. Work with your group, but your group should not write YOUR script. Don't let them direct you over word use. If you don't plan to speak like you normally speak, in a way that's "you," then you'll sound like a robot. You can write a script, but then forget the script! If it makes you more comfortable, write a script to make sure that you're including all the important information. But try different ways of "writing" the script: tape record yourself talking, speak out loud while you type. You want to make sure you're speaking a script that you're then writing down, and not writing out an essay that becomes a script. Memorize your script in terms of main points and the order (not specific wording). You want to be so familiar with the material that it's easy to deal with distractions that might come up. Try to feel comfortable with your content and presentation plan at least a week before your presentation. That way, you have some time to relax and live with it, and pressure isn't building right up until the moment of the presentation. Most importantly: don't act, just be you.